I am originally from Brockport, New York, and began work after high school in the field of construction. I started working for a general contractor who took me under his wing and taught me every aspect of construction from the ground up. In time, I graduated to a position in the administrative offices of Huber Hunt and Nicholls, the twelfth largest construction company in the world, while they were building the Eastman Kodak plant in Rochester, New York. 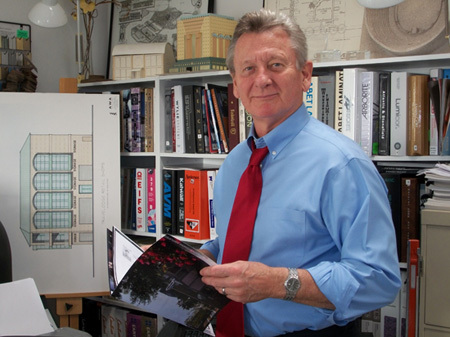 After being drafted in the U.S. Army and a tour in Viet Nam with an elite airborne unit, I returned home with a desire to attend college and become an architect. Upon graduating from San Diego State University, I spent a decade and a half working as a project manager or project architect for many large firms in California and Nevada. I have accumulated direct and extensive experience in programming, site and building design, construction documents, specifications, bidding and negotiations, and construction administration on both private and public projects inclusive of commercial, industrial, hospitality, institutional, residential, and public works projects. For example I have coordinated and supervised the design, working drawings, specifications, and contract administration for projects such as high-rise hotels, sports arenas, naval bases, shopping centers, schools, banks, office buildings, tenant improvements, and private residences. I have managed projects using virtually every construction method and material type imaginable. Stemming from my construction experience, I have become a “nuts and bolts” architect that can talk sensibly to your contractors about your project. I am always personally involved in the programming, design, space planning, preparation of contract documents, office management, consultant coordination, contract administration and even drafting of your project. When you hire me, you talk to me throughout the course of your project. My service is personal; I attend the client and contractor meetings, I perform the contract administration in the field, I oversee every detail of the project through every phase. My firm AWA Architecture, Inc., established in October of 1996, is an office with the latest equipment and technology to insure that your constraints and project coordination are met. I have a highly motivated and expandable team of consultants available for your project. I am currently licensed in the State of Nevada and the State of Washington.